Quakecheck is all about protecting your loved ones and mitigating earthquake damage to your home. Our independent risk analysis report identifies the risks and probability of damage occurring to your home in the event of a significant seismic event. Carried out and undertaken by our team of trained inspectors that understand the significance of buildings and the damage earthquakes can cause; we deliver tangible suggested outcomes and methods to mitigate or eliminate potential damage to your home BEFORE the next eathquake strikes. Quakecheck's exclusive and comprehensive report identifies the risks you need to consider to keep your loved ones safe. It provides the information you need to make informed and calculated decisions on protecting your home. Both globally and nationally we are experiencing an increase in the frequency and intensity of earthquakes. New Zealand is located on the Pacific ring of fire between the Indo-Australian and Pacific tectonic plates, with a large number of faults. 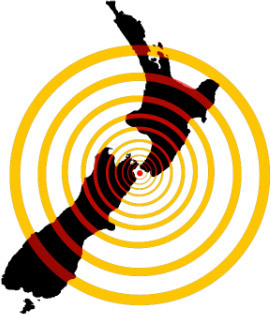 Normally New Zealand experiences around 20,000 earthquakes annually - however in 2016 we experienced an incredible 32,828 recorded quakes - that's a staggering increase of over 60% the normal average, to say nothing of the increased magnitudes currently being experienced! High risk zones include Christchurch, Kaikoura and parts of the South Island, Wellington, Hawkes Bay, and other areas throughout the country. Various councils are now considering implementing legislation to upgrade residential dwellings to an acceptable level to minimise damage to property and persons when earthquakes do strike. Quakecheck is a part of a group of independent building inspectors that operate under the umbrella of NZ House Surveys. Located throughout New Zealand we have been thoroughly trained in all aspects of building inspection and are allied to the NA Institute of Building Inspectors. Trained to indentify the various risks associated with a variety of dwelling types in earthquake situations, we are capable of suggesting and helping implement procedures to prevent and limit damage, BEFORE earthquakes occur. Our team are available now, to conduct a preliminary assessment of your current home. identify potential hazards and suggest a pathway for remedial action to eliminate or minimise the risks to your home. Remember that an ounce of prevention is better than a pound of cure; so click here to to with one of trained and local inspectors today. They're available right now, because none of know what tomorrow may bring. All inspections include identifying potential threats and faults in and around your home. Our inspections are undertaken by a trained inspector and include a visual inspection of the site, layout, complexity, roof, roof space, structure, interior, and subfloor areas of home. Our Quakecheck report includes over 30 risk issues identified as potential earthquake hazards, and seek to address those items that can eliminate, reduce, or minimise these potential threats in the event of a substantial quake. Our detailed Quakecheck report includes a list of items that should be considered to mitigate and minimise or eliminate damage to your home and comes with a free risk management assessment. Reports can then be either emailed or hard copies posted to your address, and payment methods include cash, cheque, internet banking, Eftpos, Visa and Mastercard. All our inspectors are available to talk through the implications contained in your Quakecheck report, and where required may be able to provide suggested contractors for remedial works. So relax, make the call today, protect your home and loved ones with the knowledge your home has been thoroughly Quakechecked by a team of leading building inspectors and professionals. The prudent person foresees danger and takes precautions. The simpleton goes blindly on and suffers the consequences. Complete the adjacent form, call us on 0800 487884 or find your nearest inspector here. "We've been observing slow-slip events in these regions (and Manawatu) for 15 years now, and we've never seen them happen in multiple locations all at once. "But we've never tracked slow-slip events after a large magnitude 7.8 earthquake, so this could the normal pattern after such a large quake." The slow-slip events may mean there's an increased risk of a magnitude 7.8 or greater quake in the lower North Island, GeoNet says. "Apparently, we live on a fault line and that fault line ruptured. I was talking to one of the geologists, and she said the fault that ran under our houses was only a fault they suspected was there. "It is totally surreal: you go to bed at night and the landscape is as you've known it for 21 years - and the next morning it has changed out of sight." 2016 has been awarded the dubious honour of most quakes ever recorded in GeoNet's 15-year history. GeoNet's national monitoring network recorded 32,828 earthquakes last year. The force of the quake was such that it was felt across the country. Even Auckland, usually immune to the fault lines which have plagued the south, felt the ground move. The 2010 and 2011 Christchurch earthquakes caused significant damage to Strowan House, the 123-year-old homestead at St Andrew's College. This was largely due to the collapse of its seven large brick chimneys. "At the end of the day a chimney is a chunk of masonry sitting on top of your house, and if it isn't properly reinforced, it could fall,"